If walls could talk, those of Abbey Road Studios' would reminisce about some of the most important moments and seminal albums recorded since 1931. Despite never-ending requests from passers-by the studio isn't open for visitors, but today Google is doing the next best thing. 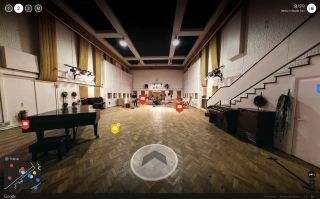 With the power of its Street View technology, Google will allow you to step inside and take an interactive tour around the building, explore the different studios, hear a number of live recordings, and even play with some of the studio's pioneering equipment. If you so wish, you can take a guided tour led by Giles Martin, the son of Sir George Martin, who famously produced The Beatles. Or you can get some of the more techy information from engineer Mirek Stiles, or listen to some other interesting fact nuggets from BBC Radio 6 Music presenter Lauren Laverne. As you explore the different studios you'll be able to jump into videos taken of recordings sessions, including those for Star Wars and The Hobbit. "We've had to really go through every fine bit of detail, scraping YouTube and looking through the Abbey Road archive as well to pull out all these hidden gems," Google Creative Lab's Tom Seymour told TechRadar. "We actually did a lidar scan of each studio so we had a 360 model of each of the spaces. And then we've captured the space with these 360 panoramas but with a HD format." From The Beatles' Sgt. Pepper's Lonely Hearts Club Band to Pink Floyd's Dark Side of the Moon to Radiohead's Kid A, some incredible recordings have taken place inside Abbey Road Studios, and Google's interactive tour touches on many of those historical moments. You can go explore it right now by clicking on this link on your desktop, phone or tablet.